An unbeaten Tom Latham hundred and Kane Williamson's fine knock capped a dominant day as New Zealand took control of the first Test against Sri Lanka. 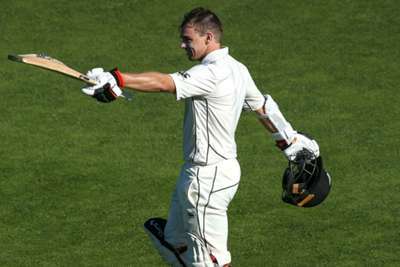 Opener Latham finished 121 not out at stumps on day two, with New Zealand 311-2 in reply to Sri Lanka's 282 in Wellington on Sunday. Black Caps captain Williamson (91) fell agonisingly short of a century as the hosts earned a 29-run lead with eight wickets in hand at Basin Reserve. Day two belonged to New Zealand after Sri Lanka added just seven runs to their overnight score, with Tim Southee (6-68) claiming a six-wicket haul by coaxing an inside edge from Lahiru Kumara (0). New Zealand made a strong start as the wicket, which wreaked havoc for Sri Lanka on day one, turned into a batter's paradise on Sunday. Jeet Raval scored 30 of New Zealand's first 39 runs and looked comfortable, moving within seven runs of a half-century before he gifted his wicket away. There was only one delivery remaining prior to lunch when a rash pull shot off Kumara (1-79) sent Raval back to the pavilion, with the Kiwis 59-1 at the break. Sri Lanka lacked ideas as they struggled to put New Zealand under sustained pressure – Latham and Williamson combining for a 162-run partnership. It was a masterclass from Williamson, who posted his 29th Test half-century and scored 71 to lead his team to 175-1 at tea. But with a ton in sight, Williamson's only mistake of the day proved costly as the skipper – whose highest Test score came via an unbeaten 242 against Sri Lanka at the Basin in 2015, was left to lament a missed opportunity. Williamson failed to keep his sweep shot down, sending Dhananjaya de Silva's (1-79) delivery straight to Kasun Rajitham, before Latham's seventh Test century from 219 balls and Ross Taylor's 50 not out put New Zealand firmly in command.